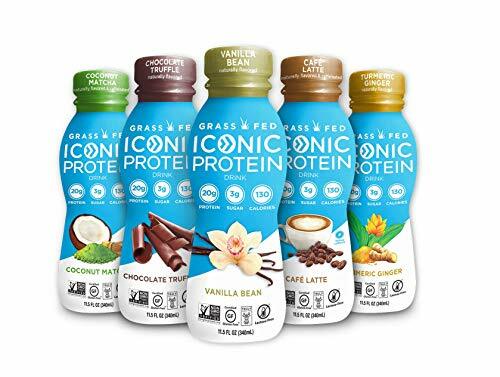 SAMPLE ALL 5 FLAVORS BEFORE COMMITTING TO A 12-PACK: Sample every delicious flavor of ICONIC grass fed protein drinks with our 100% satisfaction guarantee: Chocolate Truffle, Cafe Latte, Vanilla Bean, Turmeric Ginger, and Coconut Matcha. Yum! KETO, PALEO, AND DIET FRIENDLY: with 3g sugar, 4g fiber and 130 calories, Iconic protein shakes are a great option for those on low-carb, low-sugar or weight loss diets. ONLY 2 Weight Watchers Points per shake!